Celebrated local naturalist Bernd Heinrich brings us a new book HOMING INSTINCT - a captivating exploration of The Homing Instinct in animals, and what it means for human happiness and survival. Come hear Bernd speak at the store on May 27th at 7pm. This event is free and open to the public. Naturalist Bernd Heinrich will be at The Galaxy Bookshop on Tuesday, August 14th, to discuss his new book, Life everlasting: The Animal Way of Death. Explore the concept that “we come from life, and we are a conduit into other life,” with Bernd Heinrich - UVM Professor Emeritus of Biology and the author of Winter World, Summer World, and other popular nature books. When a good friend with a severe illness wrote, asking if he might have his "green burial" at Bernd Heinrich's hunting camp in Maine, it set the acclaimed biologist/author on a path that had long fascinated him. How exactly does the animal world deal with the flip side of the life cycle? And what are the lessons, ecological to spiritual, raised by a close look at how the animal world renews itself? Heinrich lends his wholly original gaze to the fascinating doings of creatures most of us would otherwise turn away from --carrion beetles burying a field mouse; the communication strategies ravens, "the premier northern undertakers," use to do their work; and the "inadvertent teamwork" among wolves and large cats, foxes and weasels, bald eagles and nuthatches in cold-weather dispersal of killed prey. Heinrich reveals, too, how and where humans still play our ancient and important role as scavengers, thereby turning--not dust to dust--but life to life. Bernd Heinrich is an acclaimed scientist and the author of numerous award-winning books, including the bestselling Winter World, Mind of the Raven, and Why We Run. He also writes for Scientific American, Outside, American Scientist, and Audubon, and has published book reviews and op-eds for the New York Times and the Los Angeles Times. He studied at the University of Maine and UCLA, and is professor emeritus of biology at the University of Vermont. Heinrich divides his time between Vermont and the forests of western Maine. Bernd Heinrich , Summer World: A Season of Bounty. 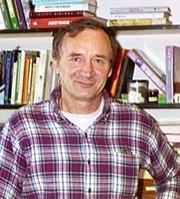 Bernd Heinrich is currently considered a "single author." If one or more works are by a distinct, homonymous authors, go ahead and split the author. Bernd Heinrich is composed of 5 names. You can examine and separate out names.